The Dark Hadou must have taken hold of you if you haven't seen this movie. Street Fighter II has come a long way during the outstanding 10 years of its existence. Heralded as one of the pioneers of the video game genre, the acclaimed series has crossed over tides of not only gaming, but animation as well. Street Fighter II: The Movie made it's debut in the early 90's, gathering audiences to enjoy the game in animation form. Thereafter, the Street Fighter II V TV Series aired. 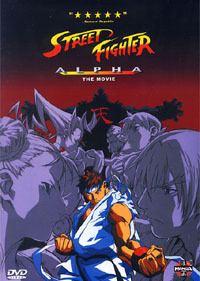 Now, Street Fighter ZERO: The Animation (also known as "Street Fighter Alpha: The Movie") assumes its place as the sequel to the smash hit Anime. Based on a terrific storyline and stunning artwork, SFZ stands as substantial evidence that Street Fighter the Series is long from discontinuation. Following suit with the continuous flow of hit arcade and console games, the release of this animation couldn't have made the flow of this series more wonderful than it already is. Directed by Shigeyasu Yamauchi, CAPCOM's original story is brought to life with the artwork supervision of Hiroshi Katou. Aided by a team of sophisticated scriptwriters and artists, as well as phenomenal seiyuu, Street Fighter Zero is surely something one would not want to pass up. Trained by the legendary Gouken in the arts of the Shotokan, Ryu and Ken have long continued to better their skills of an art that was once taught in order to kill. The death of their honorable master reunites the two once again after a time of separation; however, a mysterious channel of chi hangs in the balance. "Satsui no Hadou", or the Dark Hadou, stirs within the soul of the noble warrior, Ryu. Slowly slipping into the evil depths of power, Ryu strives to fight it at all costs, rather than become like his nemesis, Gouki. As for head-lady role Chun-Li, Interpol work is the situation at hand. It seems that a figure named "Dr. Saddler" has been luring skilled fighters from around the world for some diabolical plan, which was yet to be determined. Hot on the trail with her partner Wallace, Chun-Li meets up with Ryu and Ken, as well as the other fighters upon investigation. Will the Street Fighters prevail? Who IS this young boy Shun?! Does Dan get horrendously murdered more than once?! Find out by picking up this must see movie a.s.a.p. !